Gregory Funaro grew up in Cranston, Rhode Island, and wrote his first story, The Ghost in the Window, in the fourth grade. He considers this to be his finest work, but unfortunately it has been lost to time. Following high school Greg majored in theatre at the University of New Hampshire, and after various acting gigs, received his AM in Theatre Arts from Brown University and an MFA in Acting from the FSU/Asolo Conservatory. 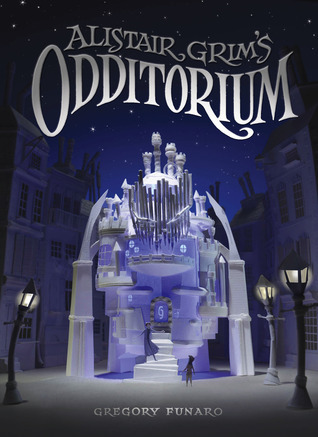 Greg teaches drama at East Carolina University, and is busy working on the next book in the Odditorium series. Grubb escapes from the frying pan into the fire when he flees the only home he's ever known to escape his abusive guardian. But joining Alistair Grim and his unusual collection of Odditoria that make up his family gives him a taste of something he hasn't had in a long time: a home. But the Odditorium is full of the unusual and the strange and Grubb finds himself in deep trouble almost before he knows it as he faces off with doom dogs, the Black Fairy, and a skeleton army. I think what I enjoyed most about this book is the wide array of characters with their interesting idiosyncrasies, from Grim himself to a banshee, a witch, and a talking pocket watch. Grubb is an appealing character from the first page with his surprisingly upbeat outlook considering his poor circumstances. The appeal grew as I read about Grubb's facing off with not only Grim's enemies but his own mistakes. One of the things I find fascinating about steampunk is how it often includes not only the mechanical but the fantastical. Alistair Grim has managed to combine both his own fabulous inventions with the odditoria that he has collected in his travels. The author has done a really nice job of providing enough explanation for the reader to figure out the ins and outs of the world he has created while not bogging down the action. I've found with child readers that that is especially important. The action here is constant enough to pull readers in and keep them reading. I am very much looking forward to reading the coming sequel. 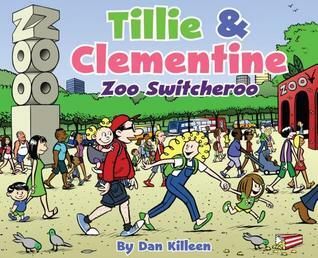 Tillie and Clementine go with their parents to spend a fun day exploring the zoo. They happen to be there, however, on the same day a daddy gorilla and his baby daughter sneak out of their enclosure to do the same thing! At one point the two dads get distracted, accidentally grab the wrong daughter, and hoist them up for a piggyback ride. Soon Daddy is walking around with a baby gorilla on his back, and the big silverback gorilla is walking around with Clementine on his. How will the crazy Zoo Switcheroo get resolved? This richly illustrated, whimsical tale shows how parents and kids, whether gorilla or human, can be easily distracted with perilous yet funny consequences. Until near the end, no one in the story is aware of the monumental mix up that has occurred. Young readers therefore have a privileged perspective as they know something the characters in the book do not. Expressive, humorous illustrations entice kids to read and reread Tillie & Clementine stories, and in the process youngsters may broaden their reading skills. These books do contain the occasional challenging word, but kids can derive the meaning from context clues in the nearby copy and artwork. Tillie & Clementine are two adorable sisters who don't always get along. When Tillie and Clementine go to the zoo with their parents they get into an argument that leads to an unexpected switch. While the text is more than adequate it could have used a bit more editing (too much use of the word fun) it's the illustrations that are the real draw here. Reminding me of the old Dennis the Menace comic strip, the cartoon style of illustrations are bound to draw children in. The plot is certainly giggle-inducing and the main characters are believable and easy for young children to relate to. Tillie and Clementine live with their parents in an old brick house down in Benton Park. One night Mommy has to go to a neighborhood meeting, leaving Daddy in charge for a few hours. He manages to make the girls dinner, get them ready for bed, and tell them a thrilling bedtime story. A little later, though, the girls are awakened by strange noises coming from just outside their window! What could it be and what will they do? Noises in the Night contains a story within a story when Daddy tells the girls a bedtime tale about two princesses. For about the middle ten pages we are in the medieval world of castles, crowns, and dragons before returning to the original narrative and present day. From there young readers enjoy anticipating the finale of the book as it echoes the plot of the bedtime story. This device encourages children to recognize patterns and themes in books. 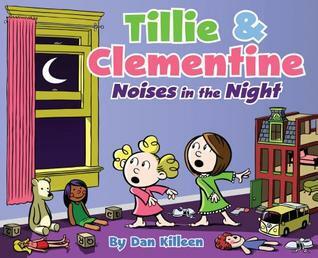 Expressive, humorous illustrations entice kids to read and reread Tillie & Clementine stories, and in the process youngsters may broaden their reading skills. These books do contain the occasional challenging word, but kids can derive the meaning from context clues in the nearby copy and artwork. When Tillie and Clementine's mother goes out to a meeting the girls are left in the hands of their father who does a nice job fixing dinner and telling a bed time story. However, the story has unintended side effects when he locks himself out of the house and has to find an alternative way into the house. Young children are bound to find the book funny and the cartoon illustrations encourage that humor. The illustrations were my favorite part making me smile and even laugh at moments (especially at the end, sorry, no spoilers). Certainly the solutions to the problems in the story are creative and entertaining. An enjoyable book. Cynthia Moss was never afraid of BIG things. As a kid, she loved to ride through the countryside on her tall horse. She loved to visit faraway places. And she especially loved to learn about nature and the world around her. 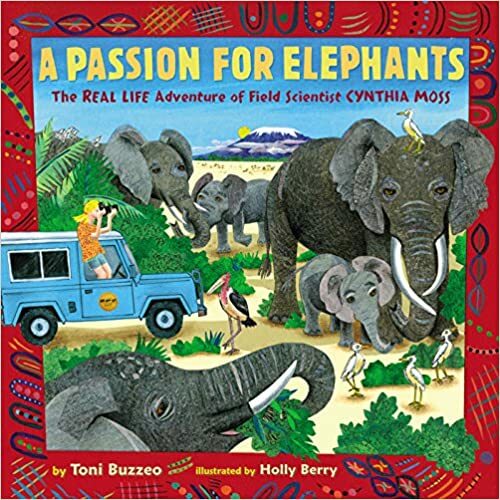 So when Cynthia traveled to Africa and met the world’s most ENORMOUS land animal, the African elephant, at Amboseli National Park in Kenya, she knew she had found her life’s work. Cynthia has spent years learning everything she can about elephants and sharing these fascinating creatures with the world. She is a scientist, nature photographer, and animal-rights activist, fighting against the ivory poachers who kill so many elephants for their tusks. This lyrical and accessible picture book gives kids a glimpse of what scientists do in the real world and inspires them to dream of accomplishing BIG things. Buzzeo has done it again. She's created a fascinating and inspiring account of a woman who once intrigued by elephants remained in Africa for decades studying them. The text works just right as a story of a girl becoming a woman, a rather fearless one, not afraid to take on something big. From a large horse to the ivory trade, Moss has truly left her mark on the world. The illustrations are gorgeous and I loved them. This is the sort of picture book that I not only love to share but I enjoy just sitting down and looking at for pleasure. The combination of paper collage with colored pencils, paints, watercolors, and ink makes for an interesting mix with both textured and soft lines. A beautifully presented and well-told story bound to inspire listeners to take on big themselves. Put Me In The Story, the #1 personalized book site in the U.S., has just released 3 new books starring some of your favorite children’s characters, just in time for back-to-school season! Create a fun and engaging reading experience with you personalize the books with your child’s name, photo, and a dedication messagewww.PutMeInTheStory.com. Winners will be notified September 17, 2015. Grab your backpack and lunch box! It is time to get ready for the first day of school with your friends on Sesame Street. Elmo is so excited to go back to school, but he needs your help. Everything is easier with a friend by your side. Follow Elmo from bedtime to breakfast then ride the bus to see what a blast school can be! If every day is like this, you are sure to have a shining school year. Personalize this book with a great picture and encouraging dedication message for a special reminder before your cutie heads to class. Adventures can happen at any time, especially on the first day of school! Join your new classmates, Dora and Boots, as they journey back to school. First, you must help your teacher get to the classroom before the last bell. No problem is too big for a curious adventurer. You will run into old friends and learn fun, new things along the way. Dora will help you read, count and speak Spanish. Personalize this book with a picture and a message to help your explorer on the path to learning. Every stellar student loves a good adventure! Head back to school with a bright bunch of characters. Hello Kitty and her twin sister, Mimmy, have saved a spot just for you! You will count fun objects, find letters of the alphabet, paint colorful pictures, and play with your classmates. From breakfast to the last bell, Hello Kitty turns every second into a learning moment. Show your little scholar that sharing special moments and spending quality time are lessons that do not need to be taught. Personalize this vibrant book with a picture and dedication message for the smartest student that you know! Thanks to the publisher I received a personalized copy of Elmo goes to School. The cute illustrations are bright and cheerful and typical Sesame Street. The inclusion of the child's photograph in the story adds to the fun, especially the photograph hanging over Elmo's bed. The story addressed the child asking them to help Elmo prepare for and go to school. Having read the book with the nephew I ordered it for I can tell you it is an interactive experience and a fun one. This is a fun book to help parent and child prepare for the first time attending school. Put Me In The Story creates personalized versions of bestselling books featuring your favorite characters. Our gifts capture moments that matter and memories that last. With each touching picture and special dedication message, our readers have become our most dynamic characters. Don’t tell just any story, tell your own! Put Me In The Story inspires a love for reading, across all ages and generations, through the experience of shared, personalized stories. Share a story with your family now at www.PutMeInTheStory.com. Two English Setters, Rusty and Purdy, see a deer with a purple nose and ask her how her nose became purple. The deer denies having a purple nose. The dogs talk to 10 different backyard birds to solve the mystery. A chipmunk, ground hog and racoon help also. The book is all photographs on glossy pages so it is fun for all ages, but targeted for 2 yrs to 3rd grade. When I heard about this book full of photographs that's a mystery I was definitely intrigued. And now having read it, I still find it a remarkably clever idea. First off, the photographs are beautiful and arranged in a way to tell the story. It's amazing the way the author/photographer managed to take photographs that work so well. 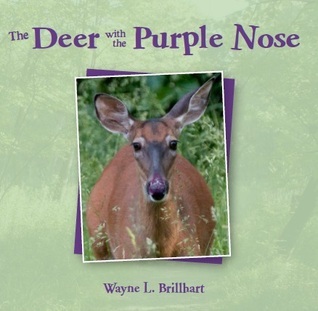 The main characters are the dogs Purdy and Rusty who see their friend Dottie the deer with a purple nose and are determined to find out why. The dogs start by talking to the animals around them to see who saw Dottie last. Many of the animals they talk to are different types of birds. While I figured out the answer to the mystery very quickly, I don't think most children will figure it out as quickly and those who do will be thrilled to be right. Part of the purpose of the book is to highlight different types of birds from the Americas. The end of the book shares additional information about each of the different types of birds, as well as information about the ideas and photographs in the book. A different type of mystery that joins both the beauty of the natural world and a fun mystery. Case brief: A local schoolteacher is missing, and the only thing fishier than the circumstances surrounding his disappearance is the smell coming from the bag he left behind. All clues point to billionaire businessman Frank Pandini Jr.--but why would Pandini get his paws into the illegal fish trade? Who but the creator of the Lunch Lady series could come up with a noir crime series staring platypuses. I wasn't entirely sure going in how much I would like this series, but I ended up quite liking it. This feels so much like one of those crime tv shows except appropriate for kids. You have the rookie who is full of confidence and enthusiasm but tends to be impulsive and reckless. There is also the older mentor who is gruff and sloppy but has the experience to be a good cop. And of course there is the mystery underlying the main plot that goes beyond the one book. Zengo (the rookie) strongly dislikes Frank Pandini Jr. despite the panda's reputation for doing good things for Kalamazoo City, it goes back to the days when Zengo's grandfather took down Pandini's father as the source of much of the mob activity going on in the city. Unfortunately, Zengo's grandfather was murdered on orders from Pandini Sr. from prison. So Zengo is more than ready to blame Pandini for the illegal fish scheme, but Mallory tries to reign in his overzealous partner and get him to focus on the evidence. Who is right? And can the two very different partners learn to work together in time to solve the case. For young readers who enjoy mysteries and don't mind the use of animals as the main characters this is bound to be a fun series. Zengo, a platypus police detective, has several months on the job under his belt, but still gets called rookie by his coworkers. But at least he and his partner, O'Malley, are getting along better. Which is a good thing when they get sent to figure out what went wrong with the opening of the Kalamazoo City Dome, the new amusement park. It seems clear that sabotogue occurred but who and why are much less clear. 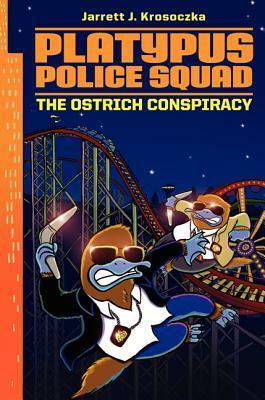 Krosaczka has created another fun mystery starring his platypus detectives. Another winner for fans of the first book and the Lunch Lady series. 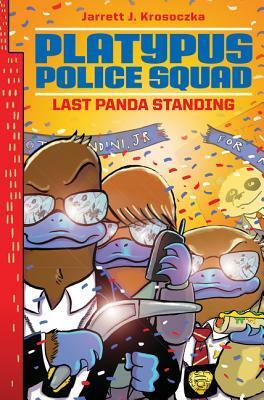 In Last Panda Standing, things take an interesting turn when Detective Rick Zengo is assigned to protect Pandini from an attacker as he runs for mayor. Zengo's doubts about Pandini's honesty start to waver a bit with Pandini's campaign promises. Not that he trusts the panda entirely, after all Pandini's father did order his grandfather's death. While Zengo works with Pandini, his partner O'Malley teams up with a new detective to hunt down the culprit. I didn't really expect this series to take the turn that it does in this book and while it makes for a more interesting series and creates more tension, I found it a bit irritating. The reason for that I can't say without spoiling the shocker at the end. 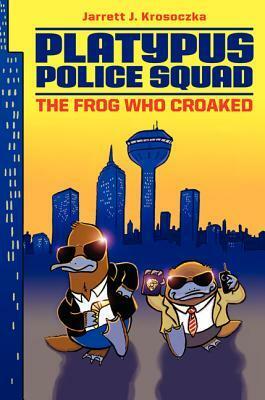 But I am definitely cheering for the Platypus Police Squad to up the ante and take down the villains in future books. They run in packs, stalk their prey, and howl at the moon. And no matter where you are--they're always lurking somewhere nearby. Wolves, the predatory puppy dogs of the wild, are feared and loved by people everywhere. But are they misunderstood? 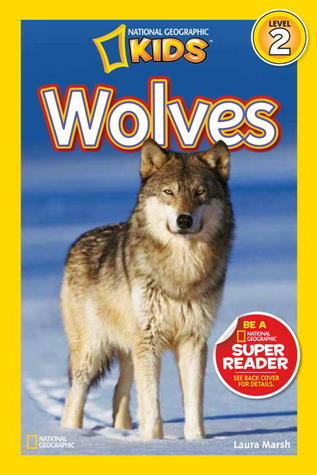 In this fascinating level 2 reader, you'll learn that there's much more to being a wolf than most people could ever believe. Did you know that each pack has a pecking order? That wolves can "talk" to each other using body language? Or that they're actually not out to attack humans, they usually leave people well enough alone? Full of incredible photographs and interesting information, NGR Wolves will appeal to all kids. Wolves are a popular topic with children. Young readers can't help but want to know everything they can about their favorite animal. 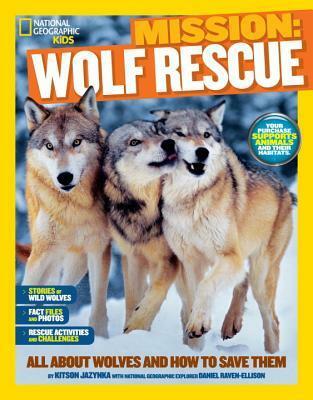 These National Geographic Readers are a great resource for these type of young readers. Not only are they well-written, sharing great factual information, but they have amazing photographs and a fabulous book design. I even learned some things reading this book. For example, I didn't know that there are more than thirty kinds of gray wolves. Inspiring young animal lovers to get up close to howling wolves and the real-life challenges they face is what Mission: Animal Rescue: Wolves is all about. With fun and amazing adventure stories, gorgeous photography, hands-on activities, fascinating information, and more, this book taps into kids' interest in animals AND their passion for saving them. Meet real-life wolves and learn about their habitats, challenges, and successes, plus learn how YOU can take action and save these amazing endangered creatures. Wolf Rescue is a fun book for wolf fans who not only want to learn more about wolves but those who want to get involved in helping to save them. Now of course most children can't participate directly in wolf research, but this book provides some ideas for ways that children who love wolves can learn more about wolves and about research by exploring their own neighborhoods and looking for dogs and other canid activity. There is additional information about specific wolves and wolf researchers who've worked hard to study and save wolves. The beautiful photographs add the perfect touch. This book is a good resource for young readers who not only want to know everything they can about wolves but how to help save them as well. 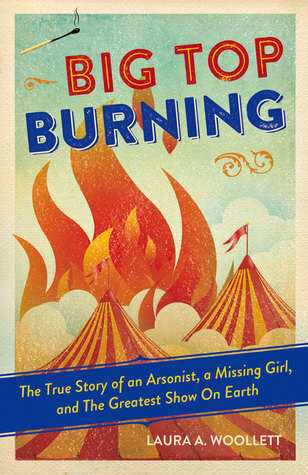 Big Top Burning recounts the true story of one of the worst fire disasters in US history. It follows the tragic stories of the Cook family—including children Donald, Eleanor, and Edward, who were in the audience that day—and 15-year-old Robert Segee, a circus employee with an incendiary past. Drawing on primary sources and interviews with survivors, author Laura Woollett guides readers through several decades of investigations and asks, Was the unidentified body of a little girl nicknamed “Little Miss 1565” Eleanor Cook? Was the fire itself an act of arson—and did Robert Segee set it? Young readers are invited to evaluate the evidence and draw their own conclusions. There is something remarkable compelling about disaster stories. Fire especially is something that the human race is fascinated with, sometimes in a good way, all too often in a negative way. Here we have a story of one such fire, a fire that may have been started on purpose. The ongoing mystery is part of the draw here as the author presents what is known about the events leading up to the fire and what followed. Like all too many historical events, the answer is not clear-cut and I appreciated the way the author made that clear. Like many disasters this one could have been prevented, but human beings tend not to make needed changes until the need blows up in our faces. This book reads very much like a novel making it a great addition to both personal and shared libraries. Fire is both an incredibly fascinating phenomenon and a sometimes terrifying reality. 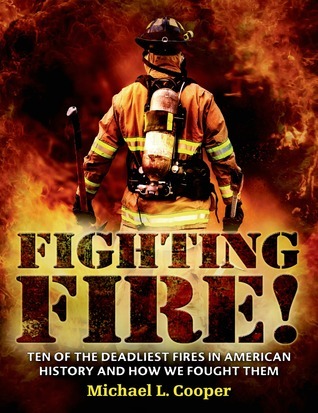 Fighting Fire shares with the reader the terrifying side of fire and the courage of those who fight it. Each chapter focuses on one of the ten major fires that caused both tremendous damage and in some cases, loss of life. The book is over 200 pages and so is likely to appeal to more advanced readers, although the many photographs included do a great job breaking up the text. The text also reads more like a narrative making the book easy to read. The large font and spacing also add to the ease of reading the book. This book highlights how far civilization has come in the fight against fire while also reminding the reader of the sacrifices that people have made along the way to achieve these advances. This is the type of book that makes history come alive to the reader. At the dawn of the twentieth century, thousands of immigrants are arriving in the promised land of New York City. Twelve-year-old Sarah has always dreamed of America, a land of freedom and possibility. In her small village she stares at a postcard of the Statue of Liberty and imagines the Lady beckoning to her. When Sarah and her mother finally journey across the Atlantic, though, tragedy strikes—and Sarah finds herself being sent back before she even sets foot in the country. Robert Sharenow lives two dramatically distinct lives. He is a gifted author who has won the admiration of critics and readers with his captivating historical novels for young adults. He is also an Emmy award-winning television producer and is the Executive Vice President and General Manager of Lifetime and A&E Network. 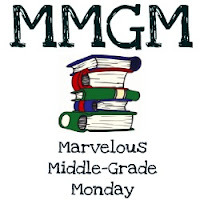 His debut novel, My Mother the Cheerleader, was named one of the "Best Books of the Year" by the American Library Association, School Library Journal and the New York Public Library and his second novel, The Berlin Boxing Club, received the Sydney Taylor Book Award and was a finalist for the Walden Award. A starred review mainstay, Sharenow's novels have been hailed as "compelling" (Kirkus Reviews), "masterful" Publishers Weekly), "Well-drawn, complex...(and) gripping" (School Library Journal). The idea of a girl living in the Statue of Liberty intrigued me from the moment I first read about it. I was grateful to obtain a copy of the book and I'd glad to have read it. Sarah is the kind of character that I love to root for, who digs deep inside herself to find a way to survive in America on her own. I found it interesting that Sarah's country of origin isn't ever mentioned but then again it doesn't really need to be, many countries have mistreated their own citizens for a variety of different reasons. Sharenow explains at the end of the book exactly why he chose to write the book that way (he wanted to share a more universal story) before deciding to base Sarah's experiences on those of his own ancestors. The story reads surprisingly quickly. Historical fiction can be a tricky thing to write because the author has to balance the needs of the story and characters with the historical reality. I appreciated Sharenow's explanation at the end where he shares the facts that he changed a bit to fit the needs of the story. Sarah's resourcefulness is what really makes the story, but I also thoroughly enjoyed the other elements that are intertwined with the stories. 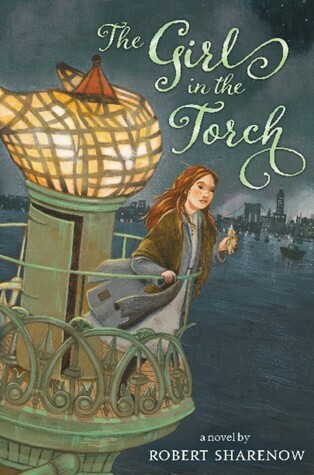 Themes of survival, bigotry, courage, and honesty all blend beautifully in this story of a young immigrant girl whose dream of settling in the United States takes a heart-wrenching turn when her mother dies at Ellis Island and she is to be sent to live with a difficult uncle. Sarah jumps off the ship and swims to Lady Liberty where she sleeps in the crown until the night guard discovers her. The glimpse of New York that Sharenow gives the reader offers a look at how life has varied greatly for those coming to America and that the American Dream doesn't just jump into one's lap. A quality historical fiction that gives a thoughtful picture of a particular time and place. Poison dart umbrellas and cyanide guns were all a part of the arsenal of tools used by spies of the Soviet KGB, American CIA, and the British MI6, but you won’t learn that in your history books! Learn true stories of the Cold War and how spies used listening devices planted in live cats and wristwatch cameras. Discover how East Germans tried to ride zip lines to freedom, while the Cambridge Four infiltrated Britain and master spy catchers like Charles Elwell were celebrated. Then make your own secret codes and practice sending shoe messages. 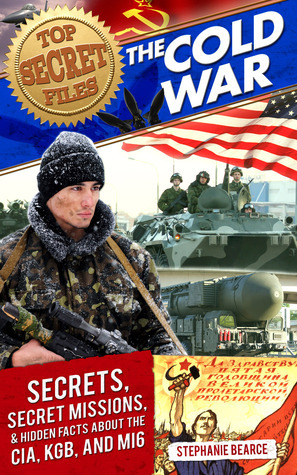 It’s all part of the true stories from Top Secret Files: Cold War. 1) The Big Dog Escape- Would you believe that one secret agent made his escape disguised as a dog? During the 1970’s, the CIA disguised one of their agents as a St. Bernard to get him out of Europe. The operative wore a fake dog suit and was concealed in a dog kennel. Nobody was suspicious when the dog was taken to the vet for a check-up, and the operative made his escape. 2) Flying Saucers- In 1956, the U.S. Air Force experimented with building its own flying saucer. The plans called for a disc shaped flying machine that would reach altitudes of 100,000 feet and fly at Mach 4. The machine they built didn’t work quite as well as they hoped. It wobbled uncontrollably if it went higher than 3 feet of the ground and its top speed was 35mph. The project was scrapped. 3) Moon Bomb- Scientists came up with some wild ideas during the Cold War, but one of the craziest was to bomb the moon. Some U.S. scientists thought that if they exploded an atomic bomb on the moon, then it would scare the Soviet Union. Other scientists argued that a mistake could seriously hurt the earth and ruin the surface of the moon. The plan was scrapped and no bombs were sent to the moon. 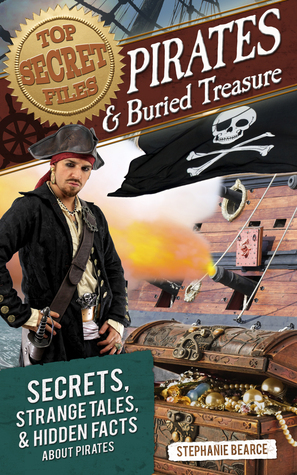 Stephanie Bearce is a writer, teacher, and history detective. She loves tracking down spies and uncovering secret missions from the comfort of her library in St. Charles, MO. When she isn’t writing or teaching, Stephanie loves to travel the world and go on adventures with her husband, Darrell.